The report has gained unprecedented significance right now in view of the general elections which are starting from April this year. All the major publications inside India and abroad have picked up this report to highlight the economic freedom and along with it hints of development and progress of various states. In this regard, India’s Prime Ministerial candidate Narendra Modi’s position has become stronger as Gujarat has outclassed each and every other state in economic freedom. Uttar Pradesh, which holds the maximum number of parliamentary constituencies in India is dismally ranked at #16, while Maharashtra, holding the economical capital of India: Mumbai is at midway of the ranking at #11. West Bengal, Jharkhand and Assam are the remaining bottom 5 states in economical freedom. Researchers who are behind this report have used publicly available data, records from official sources and information and case studies from reputed institutions. This is a factor which is often considered by policy makers and industrialists to expand or contract their commercial and economical expansion. The more economically free state will demonstrate greater degree of free market, free trade along with fulfillment of “Freedom from Want”. Hence, most of the members of the society are allowed to enjoy an adequate standard of living. In the report, every state has been given an index score. 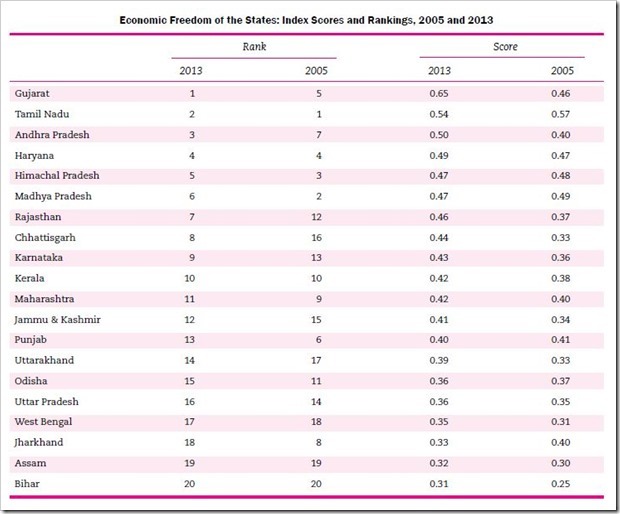 Gujarat, which is at #1 rank has an index score of 0.65, while Tamil Nadu having index score of 0.54 is at #2, Andhra Pradesh at #3 with 0.50 index score. Haryana is ranked at #4 while Punjab is ranked at #13 and interestingly, Jammu & Kashmir has been ranked #12 while Uttarakhand, another hill state is ranked at #14. Index score has been ranked at a scale of 0 to 1. Bihar has the minimum index score of 0.31. – Overall, among all Indian states, 0.43 was the mean index score, which has improved vastly from 0.38 in 2005 and 0.36 in 2009. Just to compare, Gujarat has index score of 0.65, which actually shows the huge gap between Gujarat and other states. – In the year 2005, Bihar had index score of 0.25, which has increased to 0.31 in 2013. This improvement of almost 25% is more than the national average of 10% growth. It remains in the last position because the progress has started so late. Between 2004 and 2011, Bihar has averaged 11.8% every year, which is above the national average. It used to be poorest state, but has slashed the poverty headcount ratio from 56% in 2004-05 to just 33.4% in 2011-2012. Its no longer the poorest state. The best part: Bihar’s female literacy rate has gone up by whooping 20% during 2001-2011, which is the highest among all states in India. The report clearly states that the states which are economically more free are also doing better in other arenas as well such as they have higher per capita income, more jobs and less unemployed people, roads and houses are cleaned, sanitary levels are high, and finally, it will attract lot more investment and the growth cycle will continue. Informed citizens should read and analyze such reports which can definitely help them in making better decisions while (s)electing their representatives.